Southern Vancouver Island enjoys a warm summer Mediterranean climate, but the summers have been hotter and drier in recent years. Heat-stressed cedar hedges in the city show dry tips that brown and lengthen as the months draw on; island arborists have noted increased numbers of Douglas firs and Western redcedars dying during dry stretches. Ravenhill Herb Farm, where we attend class, excavated a pond on the property last year to help with mounting irrigation demands. 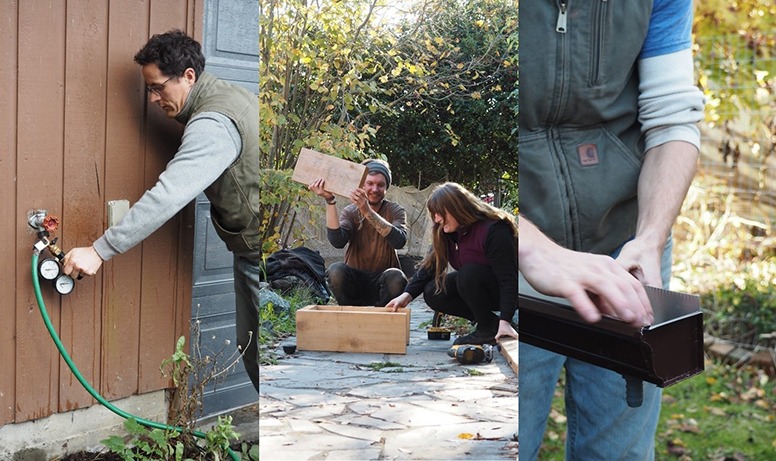 (L-R): Using a gauge to measure water pressure and flow at Tiny Tree Herb Farm; building a “living roof”-style filter box for rainwater harvesting; installing a hose fitting in an eavestrough for diverting captured water to a rain tank. In other words: targeted irrigation is becoming more and more critical in this climate. However odd it seems given the West Coast’s soggy reputation, water is regularly proving itself the single biggest limiting factor – and in turn its effective, efficient cycling and use is a core design priority. This week we spent several days of our Water Systems class learning about irrigation and rainwater harvesting with Tayler and Tim from Hatchet & Seed, and they made a compelling case for the use of drip irrigation as appropriate technology in this context. For me, the word conjures up images of the long overhead lengths of wheeled center pivot irrigation common on farmers’ fields on the prairies (or maybe the graceful arches of Roman aqueducts). But modern drip irrigation, which traces different parts of its development to California, Texas, Australia, and Israel – all places that grapple with limited water and nutrient-deficient soil – is decidedly less conspicuous. A type of “micro-irrigation”, drip releases water slowly and precisely, targeting a plant’s root zone directly. Medlar fruit on Mespilus germanica, the common medlar tree. The medlar originated in Southwest Asia, but it was an important tree in Ancient Rome and has a long literary history in the Occident – Chaucer and Shakespeare both referenced the fruit in their writing. 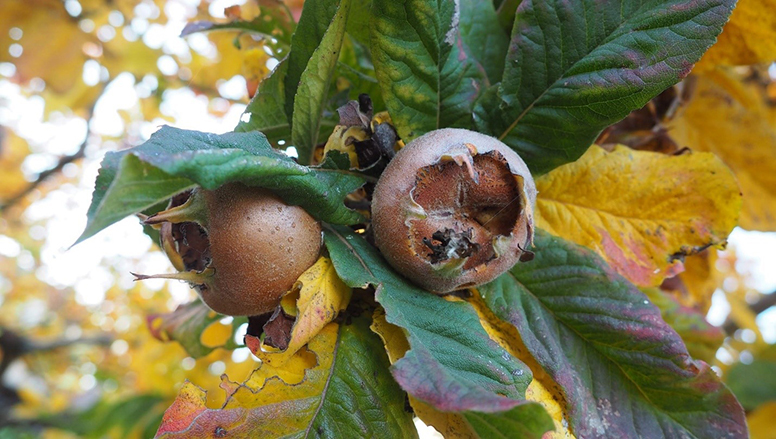 Like persimmons or quince, medlars should be “bletted” (taken beyond ripeness) in order to become edible: the process increases sweetness and reduces tannins. The medlar bears fruit in the winter, making it a good regional option for those seeking year-round food production. Tim talked us through a number of other advantages. Sometimes as important as where water is released is where it isn’t – carefully placed emitters can ensure that a drip setup limits weed pressure by pinpointing and excluding areas where water isn’t beneficial. The slow rate of release reduces water lost to evaporation, and increases efficiency, as drip can be calibrated to expel water at a plant’s own rate of uptake. Because the irrigation is delivered to the roots of the plant, foliar diseases induced by overhead watering are lessened; a drip setup can also guard against excessive salinity by providing continuously moist soil around plant roots and steadily leaching salt away. And drip can be especially effective on difficult terrain where water is prone to pooling. Tim was still listing more benefits, but I was already sold. We were at Tiny Tree Farm, where a project to daylight an underground stream meant dozens of new saplings had been planted along its banks and around a series of stream-fed ponds. So we decided to crunch some numbers for an on-site drip setup. Tayler led us to a hose bibb outside the classroom, near the new plantings. We took readings from the tap using a pressure and flow gauge, and double checked the flow rate (6 gallons per minute) against the gauge using the “farmer’s method” – a bucket and a stopwatch. 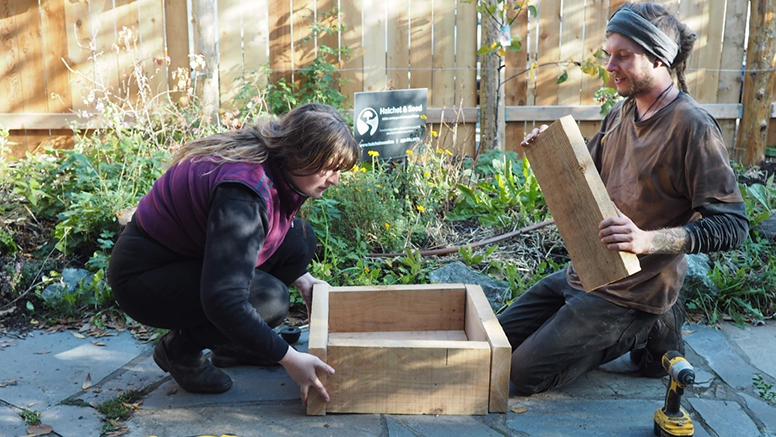 Assembling a “woven soil container” with cedar planks. The interior of the box will be lined with pond liner, alternating layers of filter cloth and pebbles, and then soil – together providing basic rainwater filtration for on-site chickens. Next, we paced off the distance from the hose bibb to the furthest sapling needing irrigation: around 310 feet. The back pasture sits on high-clay soil, and we decided that a drip line feeding 5 foot linear lengths of quarter-inch “spaghetti line” to ring each tree was appropriate. 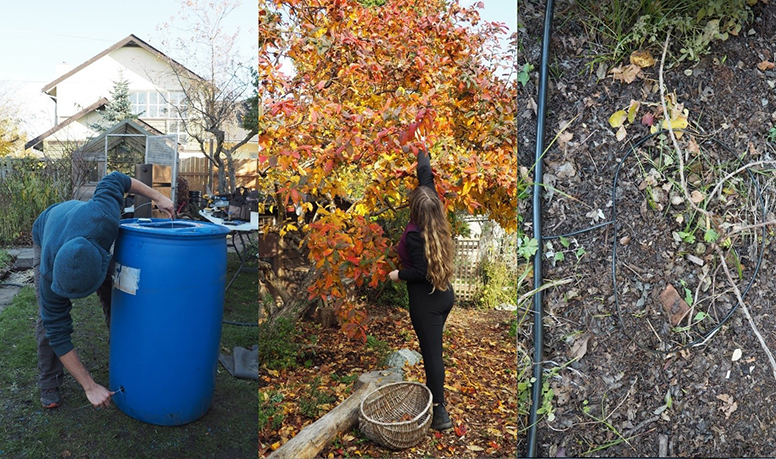 We hand-counted 59 saplings, and referenced a water use table for the fruit trees and a pressure loss chart to confirm that our flow rate and pipe diameter were within acceptable limits for the plan. Amazingly – to me – the single hose bib and a one-zone drip line would handily irrigate all 59 trees, with nearly double the volume of water required for the job available to us from the tap. The next day, we graduated to some hands-on work. At Tayler’s place, we looked over a hose bibb in the front that was connected to half-inch poly dripline running through the front garden. In line after the automated timer at the hose bibb was a backflow device – required since we were hooked up to city water. The dripline curved its way around tight spots in the garden before dipping under a hardscape path, where it ran through a protective ABS sleeve. Emerging on the other side of the path, the line was teed to permit a future line to the hazel tree, and, in the other direction, a misting system in the greenhouse. The dripline header (black) feeds three lengths of half-inch drip irrigation that run the length of the garden bed. In the backyard, we found the second zone for the drip setup. A header line ran the length of the back beds, feeding three driplines per bed, which were capped at the ends to make for easy flushing with an air compressor before winter. We extended the lines from an existing tee, running circles of micro-drip around a blackcurrant and beneath a row of towering cardoon growing along the fence. We plumbed up and installed a rain barrel against the rear of the house, and another beside the chicken run, to be fed by roof runoff. Others built a miniature “living roof” in a box, to provide filtration for the captured rainwater before it is delivered to the chickens. 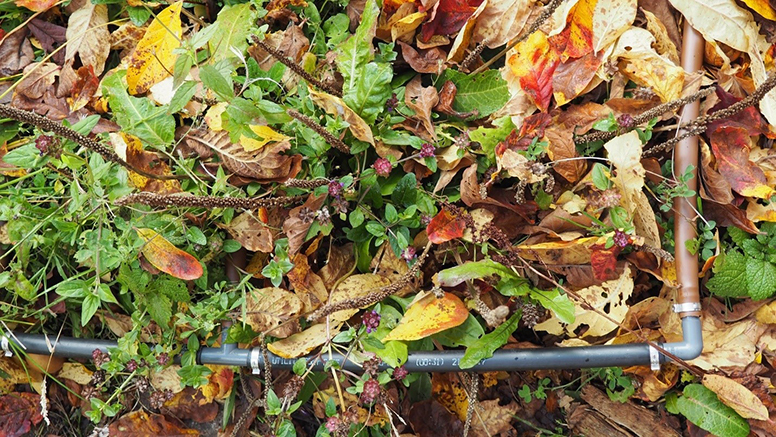 Drip irrigation has its limitations – older lines can be prone to clogging and rodent damage, and some level of monitoring is always necessary. But newer systems are better-engineered, and fabricated from recyclable materials. And the efficiency gains can be staggering. Although I maintain a soft spot for the meditative practice of hand watering, dry summers and thirsty plants go a long way to recommending drip irrigation as an appropriate technology here.